Seriously, we’ve had several shootings, a home invasion, a bank robbery right downtown and a carjacking that the media downgraded to “car stolen at gunpoint” and the City Council is talking about aggressive panhandlers? My post the other day, “Times are Hard” was merely to shed light on what one panhandler said about another panhandler (who in the past has acted aggressive towards me over “his spot”). I want to make it clear right here and now I didn’t feel like either of them were being aggressive towards me at all in my video! If the guy I talked to in my video is right then the man interviewed in the KGAN video owns a house and is saving up to buy land! CEDAR RAPIDS, IA (CBS2/FOX28) — Getting foot traffic into Westdale Mall has become a big priority for city leaders who want to see it thrive. “The west side is one of the fastest growing sides of town,” says Mayor Ron Corbett. Banking on those numbers, real estate developers in talks with the city want to put 90 million dollars into tranforming the half-empty complex, currently being held together by stores like JC Penney and Younkers. Developers want to take that 90 million dollars and create what they describe as a city within a city. The two big stores J.C. Penney’s and Younkers would stay and they would build around those with condos, retail stores, a park and maybe even a hotel. City Council members will vote on the 90 million dollar plan at Tuesday’s council meeting. CEDAR RAPIDS, IA (CBS 2/FOX 28) – Investigators say a puppy found dead outside a Cedar Rapids school died from natural causes. Last month, several viewers called CBS 2 believing the puppy was killed by kids outside of Taylor Elementary. The puppy was transported to ames for further investigation. This afternoon, the Cedar Rapids School District told CBS 2 the results of that examination turned upno evidence of abuse. They say the puppy had a significant amount of heart disease and likely died of heart failure. CEDAR RAPIDS (CBS 2/ FOX 28)—The Cedar Rapid’s Animal Care and Control group held their third annual PAWS for the Holidays Bazaar and Silent Auction Saturday in hopes of raising money to care for the city’s stray and surrendered animals.There was fine jewelry, Christmas baskets, and more than a dozen volunteers dressed as elves at the event. Shoppers browsed more than 120 items, shelling out big bucks for homeless animals. “This money helps get it that extra special veterinary care.” Webber says the city’s $800,000 budget just doesn’t cover the shelter’s needs. “Some of the stuff has to come through donations,” Webber said. The money isn’t just for medical care but also for making more room for the animals. The shelter houses approximately 150 stray dogs and cats and surrendered pets per day. They’re hoping some of the money will go toward the new shelter they’re opening October 2013 at Kirkwood Community College. CEDAR RAPIDS, IA (CBS2/FOX28) — It’s the end of the school day at Taylor School on the southwest side. Children rush to the buses and others to cars with their parents. At school district headquarters, a joint press conference with school leaders and police.“It is a school persons worst nightmare,” says Dr. Dave Benson, Superintendent.The nightmare, Dr. Benson referred to stems from the mass shooting at a Connecticut elementary school. District leaders took time Friday to easethe minds of Cedar Rapids parents, reminding them of the safetymeasures the district takes to keep schools safe. “We do have a lock door policy and a buzz in policy,” says Benson. District leaders say while they can’t go into detailed specifics of the Active Shooter Response and Awareness plan, they can tell us police response teams are constantly training and ready. Police and school officials are also urging parents to have an appropriate conversation with their children about protecting themselves at school. “We’re not wanting to create fear or paranoia amongst our community but to better prepare it, the only way we can prepare for something like this is to educate,” says Sgt. Cristy Hamblin. 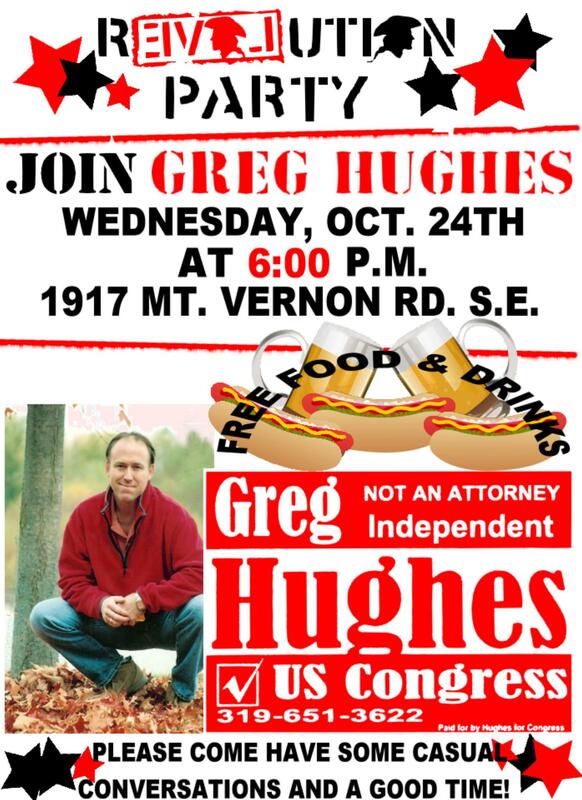 The Greg Hughes for Congress Campaign has opened an office at 1917 Mt. Vernon Road SE. If you are interested in volunteering please give Greg a call at 319-651-3622 or come to the Greg Hughes for Congress Facebook page to discuss the issues or find out how you can help! Click here for more details! It’s up to us to elect liberty candidates. When our court system is more about profit than doing its job, we have a problem. The only way we can fix it is to get the right people into elected positions. Only we can fix this! Take responsibility for your liberty and get involved today! Families are being torn apart by the system and the courts are 99.9% of the problem. You can’t make this stuff up. There are too many stories to list on this blog but I will share a couple! The stories make are enough to make one cringe! 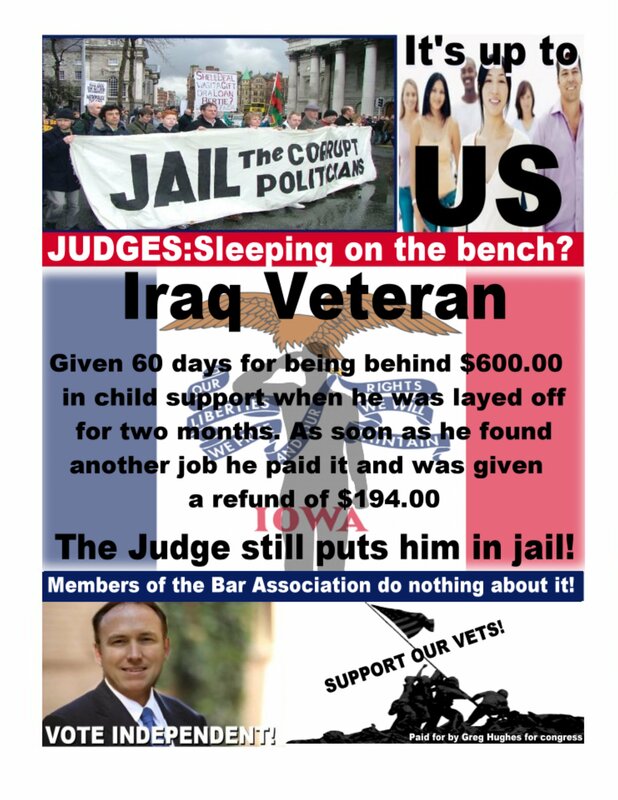 A Iraq Veteran, a victim of the economy was late making his payments to the Child Support and a judge put him in jail over it! How is someone supposed to get caught up on Child Support if they can’t work? To make matters worse the veteran got caught up and even received a refund check but the judge didn’t care he ordered more jail time. That doesn’t make any sense at all. Why are judges wasting our resources to imprison people for debt? If people were going to be imprisoned for their debt then why isn’t Congressman Joe Walsh in prison for being $175,000 behind? Something just isn’t right. Another Iowa father, Michael, is ordered by a judge to do supervised visits with his mother in-law. Even though she stated that she would “rather take a knife and stick it in his throat than look at his face”. What kind of judge puts a child that they are supposed to be protecting in a predicament like that? Iowa Judges that’s who! Not only are our families under attack but our civil liberties are as well. We need a congressman who believes in the Constitution and internet freedom. Can we count on Bruce Braley to continue to vote against these attacks on our civil liberties? I don’t know. What will Ben Lange do? Who knows! They are both lawyers and we all know that lawyers aren’t going to stop madness in the judicial system!